The United States first instituted a minimum wage standard in 1938 as part of the FLSA ( Fair Labor Standards Act ), which also established rules regarding youth employment, record keeping requirements, and government employee standards. The act was passed into law by the government of Franklin Delano Roosevelt which, if you know anything about economics and FDRs complete failure in that sphere of his presidency, should be enough of a reason to seriously question the validity of a minimum wage. When initially instituted, the minimum wage was $0.25 per hour. In 2016 dollars, that’s $4.11 per hour. The federal minimum wage ( many states have minimum wages set higher than the federal minimum ) is currently $7.25 per hour. This is the guy we have to blame for minimum wage … and a lot of other bad economic ideas. The purpose of the minimum wage is to establish a minimal standard of living to protect the health and well-being of employees. There is no question that the law has done just that. Whether that standard of living provides a net positive or net negative societal value is the question we will answer here. Following, I will show that a government-mandated, rather than market-set, minimum wage is harmful to almost all persons within a society, especially those with the least valuable skill sets and those who suffer in the deepest poverty. While the goal of a minimum wage is nobel, the tool itself is flawed. Different approaches to assisting those struggling in the bottom tiers of earning need to be taken. While I disagree with Kai on the validity of a minimum wage, I agree with him that a society is better off when all persons are given the best opportunities possible to work, contribute value, and become prosperous. I will offer some very short thoughts on alternate solutions near the end of this post and follow up with details in a future post that will link from here when it is completed. Many arguments in favor of minimum wage start and end with a failure to understand the true nature and responsibility of business. As such, it is necessary to establish a few basic understandings up front. No, you don’t. You, as a human being, have a right to pursue your own happiness, but you do not have a right to demand that another individual or group of individuals assist in facilitating that happiness, especially at the expense of their own. No one owes you a job. It does not matter how many skills you have or what level of education you have achieved. If a business does not want to give you a job, that is their choice and you have no right to be angry about it. A business looks for an employee when they have too much work for their current labor force to accomplish and adding another employee is estimated to provide a net positive benefit to the company. The business then hires the employee that they feel will best match their needs. That may not be the most highly skilled or experienced applicant. It will be the individual the company feels will provide the greatest benefit for itself. For low-skill or low-importance jobs, that may even include hiring someone based solely on how much less they are willing to earn on an hourly basis than you are. No, you don’t. Every position in every business has a maximum value that, if exceeded in cost, necessitates the elimination of that position. Put in very simple terms, if you could hand $10 to Frank on Monday and on Tuesday Frank handed you $12, you’d be happy and continue giving Frank $10 every Monday. But if you give Victor $12 on Tuesday and he gives you $11 on Wednesday, you’re going to stop giving Victor money. It does not matter whether or not Victor puts a tremendous amount of effort and skill into giving you $11 every Wednesday, you’re still going to stop giving him $12 on Tuesday. Now, if Victor only asked for $10 on Tuesday, you’d keep him around. It’s the moment that Victor starts taking more than he gives back that you stop giving him money. No, they aren’t. A business wants to attract the best possible candidates for any open position they have. As such, they will offer the most competitive wage and benefit package they can offer for the position that is available. Companies are absolutely motivated to spend as little as possible on all categories of expense, including employee wage, but they are also strongly motivated to acquire employees who will fulfill their required duties with skill and efficiency. It is well known that high quality workers seek out places of employment with high wages and good benefits. As such, there is a constant pressure on businesses to increase the wages they are offering for any given job. Such pressure is evidenced in the fact that a lower percentage of people earn minimum wage today ( 4% of hourly workers ) than ever before. In 1979, a full 13% of hourly workers earned minimum wage. 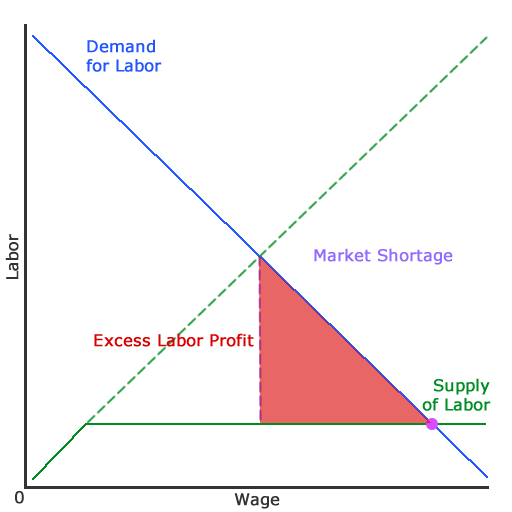 A simple graph of the supply of, and demand for, labor. As wages go up, more persons supply their labor to employers. Conversely, employers demand less as wages increase. In a free market economy, the amount of a product suppliers are willing to put into the market increases as the price of that product increases. However, the amount of product purchasers demand decreases as the price of that product increases. It’s common sense, really. If something is expensive, your desire and ability to buy it is less. However, if it is cheap, your desire and ability to buy it is higher. Conversely, if selling something makes a lot of profit, the person selling it wants to sell a lot. However, if selling something makes almost no profit, the person selling cares less about their sales. Without artificial forces ( government ) acting on the market, both suppliers and purchasers find a market equilibrium in which the amount of demand for a product perfectly equals the amount of supply of a product at a given price. There may be suppliers who are unhappy and wish to produce more of the product at a higher price and there may be customers who are unhappy, desiring to demand more of a product at a lower price … but the market supply of the product perfectly matches the market demand for the product and no one willing to make a deal at the current price is left empty handed. Labor — the work one provides for an employer — is a product. If you work for someone or are looking for a job, you are a supplier of labor. When wages ( the price of labor ) go up, more persons are willing to enter the market and supply their skills to potential employers. However, when wages go down, fewer persons find the return to be worthwhile and the supply of labor shrinks. Conversely, when the cost of labor is low, companies find that it is worthwhile to demand a lot of it. However, when the cost of labor is high, companies must be much more selective with the jobs they hire for and the demand for labor falls. In a free market, both employees and employers reach a middle ground in which maybe not all people are perfectly happy, but as many jobs as possible are being offered to the largest potential workforce available and actual unemployment becomes zero ( as all persons willing to work at a given price are employed ). If any employer offered a higher wage, perhaps more persons would be willing to work, but the employer is not willing to offer a higher wage. If a worker was willing to accept a lower wage, perhaps more employers would increase their hiring, but the worker is not willing to accept a lower wage. When a minimum wage is mandated above the market value of labor, unemployment is created by both artificially increasing supply and artificially reducing demand. A minimum wage artificially mandates a minimum price for a product. It is the minimum cost of labor that a business must pay in order to hire an employee. By establishing a minimum wage, a government tells business that, should the worth of an individual or position be less than a given amount, that business shall not be permitted to engage in hiring. 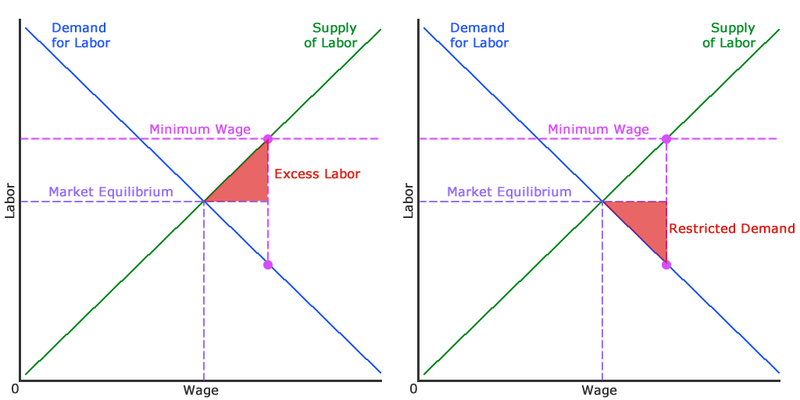 When a minimum wage is set below the point of market agreement on the value of a job, such a regulation has no effect on the supply of, or demand for, labor. It is simply irrelevant. However, should the minimum wage be set above the point of market agreement on the value of a job, it artificially deflates labor demand and artificially inflates labor supply. The result is a reduction in the total potential productive output of a society, shown in the form of unemployment. Unemployment is created in two parts. The first part is in the excess of labor supply to the market. 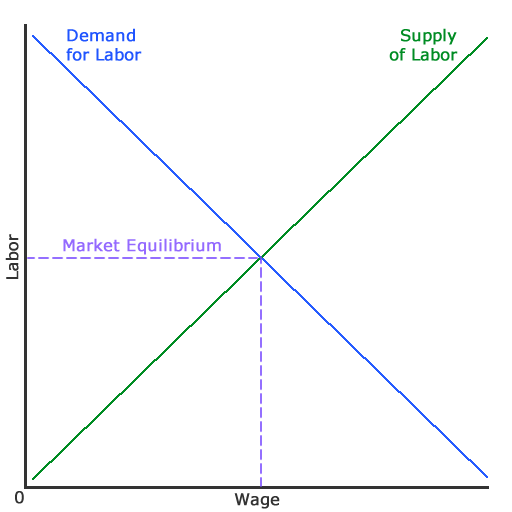 Because the price ( wage ) is set artificially high, more persons are willing to supply their labor to the market. Unfortunately, these willing participants in the labor market cannot find a job, because there are not enough positions to utilize the full supply of labor. The second part is the restriction of demand within the market. Because the price is artificially high, demand for employees is reduced and fewer positions ( with more work attached to each ) are offered. Now, an excess of potential workers are competing with each other to fill a restricted number of positions. While those who manage to get hired are certainly better off than they would have been if there were no minimum wage, an entire pool of individuals who would have been hired without a minimum wage existing are much worse off. Their effective wage is zero, despite their willingness to work and contribute to society at the agreed upon price for labor. 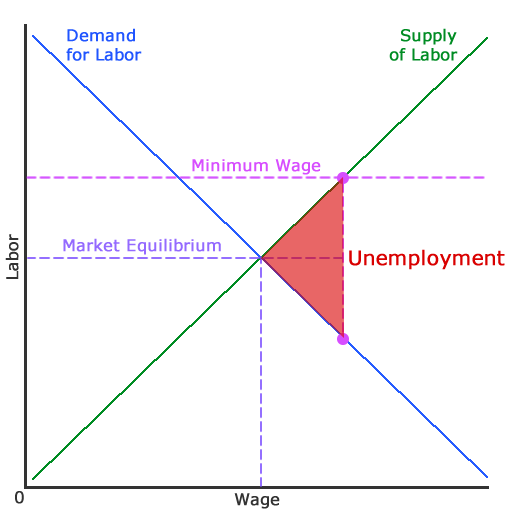 The restricted demand portion of unemployment is equal to the number of jobs that would be added should the artificial minimum wage be eliminated. It is a direct representation of lost productivity. If this explanation seems too simple to miss, well, it is. 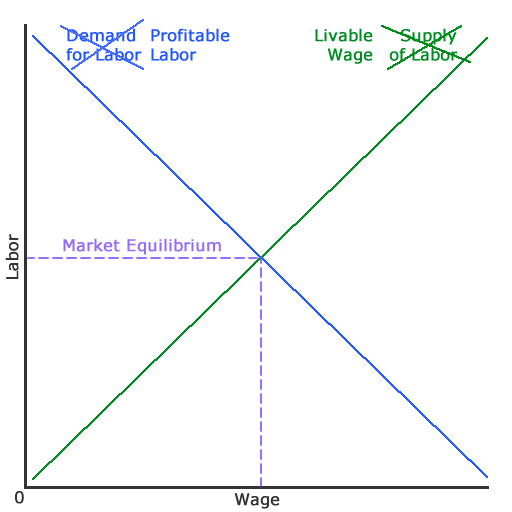 In fact, many economic studies have been published showing that the above scenario is exactly what occurs in a minimum wage environment ( and this one even refutes, through actual proper analysis of factors, the recent propagandist claim that minimum wage increases have minimal negative effect ). The net effect is to reduce total employment, increase the standard-of-living for those making the new minimum wage, decrease slightly the standard-of-living for all persons making more than minimum wage ( due to price inflation ), and dramatically decrease the standard-of-living for those who have just involuntarily been forced out of the job market. Essentially, minimum wage is nothing but a wealth redistribution scheme in which the only winners are those who currently earn minimum wage and manage to hold on to their jobs when the wage goes up. Everyone else loses. Let’s say that again: minimum wage benefits, at most, 4% of the population of the United States and directly harms the other 96% of us. That’s one hell of a policy. One of the biggest arguments used to push minimum wage increases these days is the argument that all full-time workers deserve to earn a wage that allows them the basic necessities of life: a livable wage. Common arguments against that assertion are that certain jobs simply aren’t worth paying a livable wage or that, if one wants a livable wage, they should gain the skills to earn more than the federally mandated minimum. Neither of those arguments has validity. A worker will never work for less than a wage that allows them life. Therefore, the supply of labor can — at minimum — be equated with what we might call a livable wage. The truth is, no supplier of labor would ever supply their skills to an employer without being able to meet the basic requirements of life by doing so. Those basics may not be at the ‘livable’ standard that they want or that activists fighting on their behalf want, but no employee ever works for less than a wage that allows them life. Maybe the individual shares a studio apartment with four other people, takes an hour bus ride to work every day, and eats nothing but ramen noodles, but they are living. Or, perhaps they still live with their parents, attend school, and are using an entry level job to learn work-skills that will help them later in life. So, perhaps, we should adjust our hyper-privileged idea of what ‘livable wage’ means and understand that no job will ever be accepted in a free market unless it meets the minimum standard of sustaining life. The act of taking work set below a livable wage directly results in death and being removed from the labor pool, which restricts supply and results in an increase in the price of labor. It is therefore impossible to sustain any wage that is not a living wage. An argument about a standard-of-living that provides opportunity for advancement can be had separately, but we needed to get the fallacy of ‘livable wage’ out of the way. So far, we have assumed that there is always an unlimited supply of labor that gradually increases as wage offerings increase ( our graphs show straight lines, but can just as easily be steps, waves, or wibbly-wobbly, timey-wimey stuff) and that there is some non-zero point where both the supply of labor and the demand for it intersect. What happens when one or the other of those assumptions is not true? In cases where labor supply is restricted, those supplying their labor gain an excess profit from their employment and businesses lose. In the case where the supply of labor stops increasing as wages increase ( population, education, or skill-level shortages ), employees basically get to price-gouge their employers with wages. There are several high-skill occupations in which this situation is likely true. In the case where the demand for labor and the supply of labor never meet, the result is an absence of a job market. The demand for work is never filled and eventually businesses looking to hire into the position give up and try to find alternate solutions. If you have ever worked at a salaried position and been asked to complete a mundane task on extra time, you have been on the receiving end of a business finding alternate solutions where a job market does not exist. A minimum wage increases the likelihood of such events occurring and results in employed persons doing more work without increased compensation. In all cases, both standard and irregular, it is never the employee who suffers from the results of the free market, but the business. In every free market example of wage setting that exists, the business takes most of the risks and suffers most of the disadvantages inherent to the system. That is important to understand. By offering employment to suppliers of labor, businesses take on tremendous risk. Caveat emptor. As a result, the potential for reward to the business must exceed its risk adversity before a position will be offered. So, yes, a business profits from employees just as you or I ‘profit’ from any product we purchase ( and if we do not, we regret the purchase ). It is the payout received for taking the risk of hiring an employee. What happens if we abolish the concept of a government mandated minimum wage? More people find work. Products cost less to produce and therefore less to purchase. Market efficiency and production increase. The markets, rather than activists, decide what a livable wage is. Unemployment disappears. That’s the good part, anyway. On the negative side, those who are less capable of earning high wages may find themselves feeling increasingly stuck in occupations that they would opt to leave if they thought the opportunity to do so existed. Large businesses might collude with each other to keep wages artificially low ( this happened in Silicon Valley ). A free market does not exist if suppliers feel trapped or coerced into providing their labor at a rate lower than they would voluntarily do otherwise. However, the solution to that issue is not an arbitrary, mandated increase in wage. The solution is providing the labor supplier with the freedom and flexibility they need to bid their market value up through seeking alternate employment or pursuing education and training. Rather than a wage floor charged to businesses, we need a safety net given to individuals. What that safety net is, how it gets paid for, and how we ensure it is effective and relatively free of corruption is the subject of another post, because this one is already too long. While the assertions I make here are somewhat sterilized against external forces and simplified for understanding, all of them are, without question, undeniable tendencies of a labor market backed up by many solid, scientific, studies. However, there may be considerations that I have missed. If I have, please let me know. My goal in writing is not just to send opinions into the aether, but to spur discussion and increase my own learning on a subject matter. And I cannot do that if no one has additions or contradictions to offer.